Shane MacGowan is one of those tragic figures in popular music, where you are allowed to watch a human crumble before your very eyes. What if Kurt Cobain had of drank himself to death? In the US, that rarely works, but in the UK and Ireland, an artist like MacGowan can still keep his fan base even as he teeters toward the brink of self-destruction. This has much to do with their love of the poet in those lands. Americans love to watch a train wreck and then walk away with no fondness for those who suffered. Across the pond, they have the ability to support artists long after they are relegated to the cutout bin. I love reading the back of MOJO magazine to see what acts from the US are still highly thought of enough to put on tours in decent size venues. Who is Shane MacGowan? Well, by the mid to late eighties, there was a wonderful folk-punk movement from England that came to our land featuring bands such as the Waterboys and the Pogues. These were shows where you could have the fun of slam dancing to music where the featured instruments were not the normal electric guitar, bass, and drum set-up, but instead, a stage full of musicians playing a variety of acoustic instruments, penny whistles, accordions, and the like. After a rousing set by The Pogues, it was not unusual to see men walking out arm and arm singing long lost ballads while only an hour earlier those same two persons had been rolling on the floor exchanging punches. The Pogues brought the Irish pub in all of its glory to your hometown. The Pogues were led by their shambles of a frontman, Shane MacGowan. 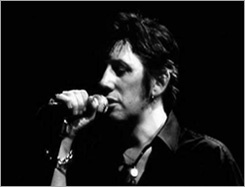 While this was the first time Americans had seen this unique individual, MacGowan was already known in London for his involvement in the 70s punk scene. He is easily spotted pogoing in front of the stage at many of the legendary London punk shows that were filmed at the time. It is amusing to see him jumping around with his friends, like Siouxsie Sioux and Billy Idol, who would later go on to sell huge numbers of records in comparison with the bands that they were watching. With The Pogues, MacGowan was allowed to develop in a similar path to the Irish poets he so revered. The only problem with this is that the demands of a somewhat successful rock act do not mesh well with the less than disciplined life of the beloved drunken poet. After close to a decade of success, The Pogues had to separate from their leader. MacGowan went on to form The Popes, where he was truly the one in control, and the band had to patiently wait for their mentor to arise from the dead once more to lead the band on another tour. Today, when you read about MacGowan in the English music press, it almost seems like a death watch. His fans love him dearly, as he seems to love his fans. They wait patiently for him to come out of his cave. They cheer him on as he plays sets that either inspire or sadden. While any other artist with MacGowan's tendencies would have been thrown to the gutter, he obviously has the luck and love of the Irish.